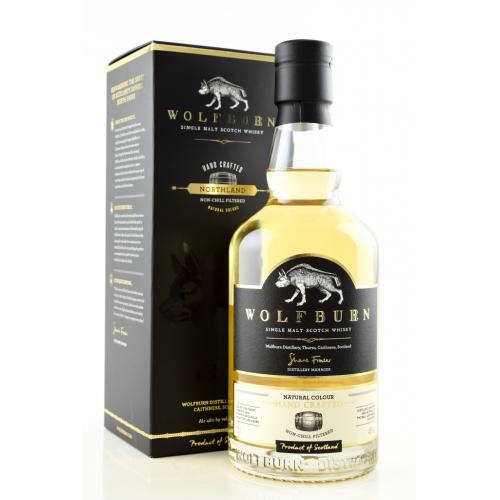 In 2011, the founders of Wolfburn Single Malt Whisky travelled to Thurso in Caithness, the most northerly town on the British mainland, in search of the old Wolfburn Distillery, originally founded in 1821. After 150 years of neglect, what they found of what was once one of the largest whisky producers in the country, was a pile of old stones. The only thing that remained was the flow of water that once fed the mash tun and stills all those years ago. The team were convinced that if the water was still there, then the whisky could be too and in May 2012, the purchase of the land was finalised. By January 2013 the new Wolfburn Distillery was complete and on Burns Night, a cask of Wolfburn Whisky - the first for nearly 150 years - was laid down in Thurso. 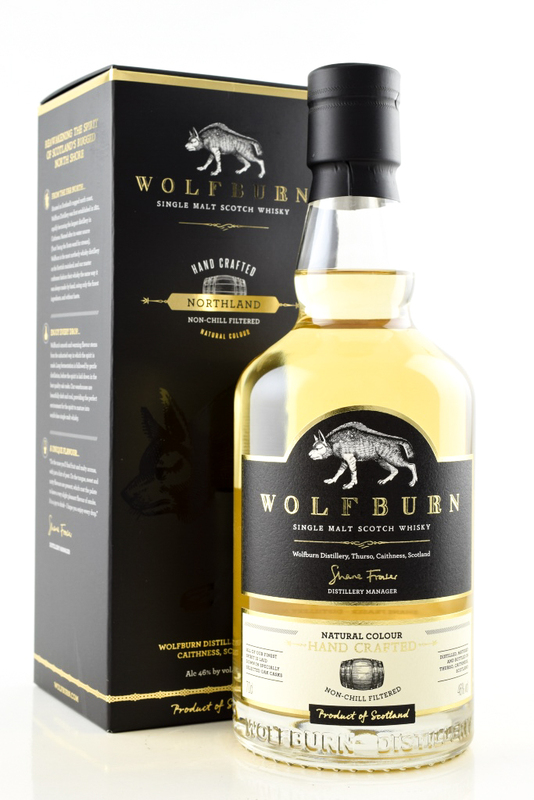 Using unpeated malt, master distiller Shane Fraser and his team have crafted the latest incarnation of Wolfburn Whisky from a blank canvas by pot still distillation, the old way; no automation, no rush and a lot of care. The worts are fermented for roughly 75 hours, allowing the yeast activity to mellow the wash, releasing a series of floral notes that carry through to distillation and maturation and are present in the finished whisky. The spirit is double distilled, slowly, first through the wash still and then through the spirit still. Once the distillation is complete the whisky is left to mature on site, in Spanish and American oak casks that are stored using traditional dunnage methods; on their side, bung up on stows, never higher than three. Nose: Fruit and malty aromas with just a hint of peat. Palate: On the tongue, sweet and nutty flavours are present. Finish: The sweet and nutty aromas pave the way to leave a very pleasant flavour of smoke.